As a decade of innovative techniques in web design comes to an end, unique style will lead us into the new decade as the front runner in attention-grabbing market trends. Minimalism and easier navigation for smaller screens will lead the trends to have major growth over the next many years. An Atlanta web designer shows a wide portfolio of unique text styling to reflect brand. More creativity with sans serif is in the future as businesses set themselves apart from the competition in design. Black and white designs will stay in the popular category to make fresh statements that pop. Introducing small amounts of color to draw one’s eye to make a decision or focus on specific information is a trend that continues to have a strong impact. The future of web design will include glitches, more video, and even micro animations. All of these forms of media draw visitors in visually and keep them on the website longer. Chatbots will have the biggest growth in media marketing. As advances in technology make chatbots more comfortable to have a virtual interaction with, businesses will include them in design more often. Simple isn’t going anywhere. When done correctly, visitors connect well with bold statements on clean backgrounds. Fading in information is a unique way to keep a minimal statement and have links easily accessible. While minimalism in web design is a higher risk for a marketing campaign, it will stay as a go-to option to keep people excited about a brand. 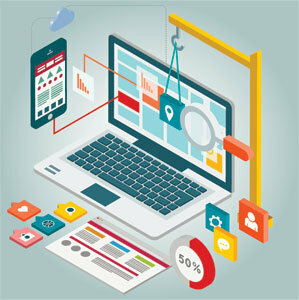 Web design is ever evolving for the most user-friendly experience. As smartphone users become the leaders in browsing online, web design will change to accommodate their needs. Considering texting and touchscreen instead of a standard keyboard and mouse is necessary to stay relevant. Key elements of a page may have unusual positions because the visitor is using their thumbs on a smartphone or tablet. Culture and diversity are growing in design. Web design emulates the acceptance of diverse human qualities and growth in cultural traits. Humans will see themselves celebrated for who they are more often in design. While these trends are just a start toward the future of web design, there are many unpredicted advances the world is waiting to discover. Many will carve a niche in web design and introduce innovative techniques we never thought were possible.